(c)2019 St. Louis Post-Dispatch, Distributed by Tribune Content Agency, LLC. Imagine how hard it would be to find good mangoes in Kathmandu. But when you have promised your boss you will make mango ice cream when she is visiting the capital of Nepal, you find them. Especially when your boss is the queen of England. Darren McGrady was the royal chef at Buckingham Palace for 11 years, and was later personal chef to Diana, Princess of Wales, for two years. Now a resident of Dallas, he is the author of two cookbooks. The job, he said, required him to travel wherever the queen went, from all of the royal residences to the royal yacht Britannia (which has since been decommissioned) to such places as Kathmandu. On an advance trip to Kathmandu a few weeks before the queen’s visit, the kitchen staff was shown wonderfully ripe mangoes. But during the royal visit, the mangoes were rock-hard, McGrady said, which precipitated the eventually successful search across the city for mangoes that were ripe. Dinner could be for one, the queen, or for several thousand at an event at the palace. He cooked for Presidents Gerald Ford, Ronald Reagan, Bill Clinton and both Bushes, George and George W.
Diana was more likely to dine with celebrities, who got involved in her charities. Once, in Miami, “the boss walked in and said, ‘Come and meet my chef,'” he said. 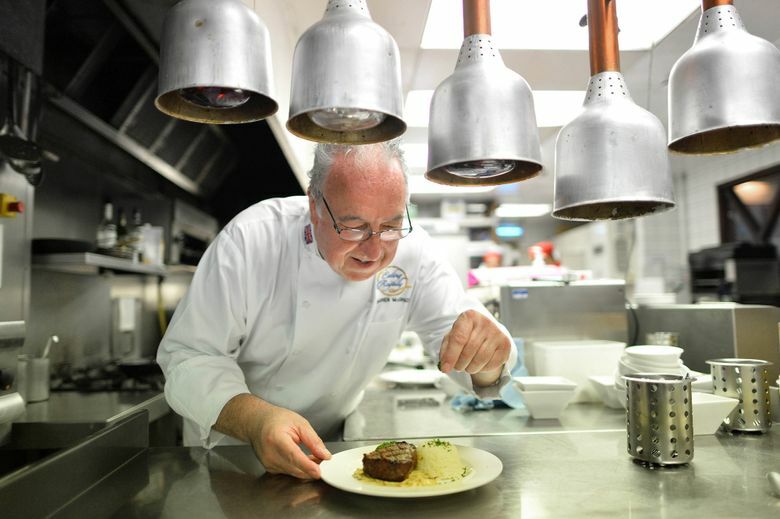 McGrady trained at the prestigious Savoy Hotel in London, rising to the rank of chef de partie – saucier (he was in charge of the people who made the sauces). He was there when Prince Charles and Lady Diana were married. “My mother and I decided to sleep outside Buckingham Palace, along with thousands of other people. When I was there, I decided that was what I wanted to do. They must have nice food and nice things,” he said. He applied for a job and was accepted, but he started at the bottom of the staff, chef No. 20 out of a staff of 20. It was a shock, coming from a prominent position at the Savoy. “I started off as vegetable chef for staff lunches. It was a while before I could even cook for the royal family,” he said. Eventually, he rose through the ranks to run the entire kitchen staff. In that time, he became intimately familiar with the family’s likes and dislikes. “The queen is a chocoholic. She loves anything with chocolate in it. And she also loves game from her estates. So if you could put on the menu salmon the Prince of Wales caught from the River Dee at Balmoral (Castle in Scotland), she would love it,” he said. Still, with access to virtually anything she could care to eat, the queen’s standard breakfast is a bowl of Special K cereal. “The queen eats to live, rather than lives to eat. She’s not a real foodie,” the chef said with some resignation. She does not like garlic and, when served beef tenderloin, prefers the burnt ends. She will not eat rare meat. On the other hand, her husband, Prince Philip, “was a bit more adventurous. He would go for things like jugged hare – hare cooked in its own blood. He liked curry, so we could put that on the menu, too. He liked anything different, so we could experiment. I think that came from his days in the Royal Navy,” he said. When he left Buckingham Palace, McGrady went to Kensington Palace, where Diana lived after she separated from Prince Charles. Diana, he said, liked healthful eating. To his surprise, the kitchen at Buckingham Palace was actually kind of disappointing. It was enormous – “you had to walk miles and miles” – and far from state of the art. The only part of the kitchen of true quality was the cookware, he said, antique copper pots and pans lined with tin and stamped on the bottom with “VR” for Victoria Regina, meaning they were used to cook for Queen Victoria. In fact, when the kitchen staff traveled, they took with them enormous hampers filled with all of their equipment: pots, pans, bowls, whisks and the like. The other British royal residences – grand palaces all – were empty of the accouterments of cooking. When laughing that “obviously, I never had any disasters” as the royal chef, McGrady did share a story about a member of his staff. They were at Windsor Castle, and the queen asked for a chocolate souffle for herself and one guest. Souffles can be tricky, and the chef was nervous; after all, he was cooking for the queen. When he opened the oven to check on the souffle’s progress, he was horrified to see that it had not risen at all. Rather than admit that the souffle had failed, he intentionally dropped the dish and broke it. He then informed the queen that, sadly, the dish had fallen and broken. Would she mind having ice cream instead?